While some areas are more prone to flooding than others, the establishment of flood warning systems near any major waterway or body of water provides critical information that can protect property and save lives. 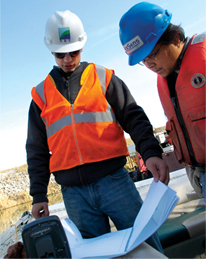 Of course, the most effective flood warning methods extend beyond the installation of gages and telemetry equipment, and employ qualified staff and carefully designed procedures to provide the earliest warning about whether a flood should be expected, when it will occur, and how severe it will be. This guide offers instruction to individuals, communities, and organizations interested in establishing and operating flood warning systems. In the United States, the U.S. Geological Survey and the National Weather Service — part of the National Oceanic and Atmospheric Administration — work together to maintain flood warning systems across the country. 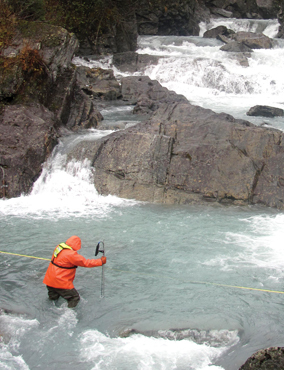 Specifically, the USGS acts as the principal source on surface and groundwater data, and operates more than 85 percent of stream gaging stations in the U.S. 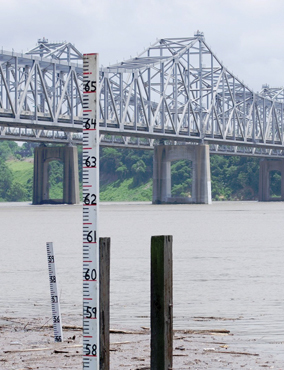 The NWS uses those data and data from other sources to issue river forecasts and flood alerts. Flood watches are issued when conditions suggest a possibility of flooding, or if flooding is anticipated within 12-48 hours. Flood warnings are more severe, and are issued if widespread flooding is expected across a large region, or if flooding is imminent or actively taking place. Flash flood watches and warnings follow the same protocol, but indicate potential for especially rapid flooding, usually from heavy rain or dam failure. Flood statements are issued when flooding is expected along major streams where people and property are not threatened. They may also be issued as an update to previous warning and watch alerts. In the U.S., these alerts are distributed in Specific Area Message Encoding through the Emergency Alert System and the NOAA Weather Radio network. In communities that lack a flood warning program, but are interested in developing their own, the NWS can provide further guidance and technical support, as well as outreach and education to involved parties and community leadership. A flood warning system need not be expensive or overly complicated, and the benefits — protecting lives and property — far outweigh any potential complications or inconveniences. When it comes to the installation and maintenance of gages, sensors, and other equipment, Fondriest Environmental can help you through every step of the process. An effective flood warning system should be based on the regular collection of local rainfall, stream level, and streamflow data. 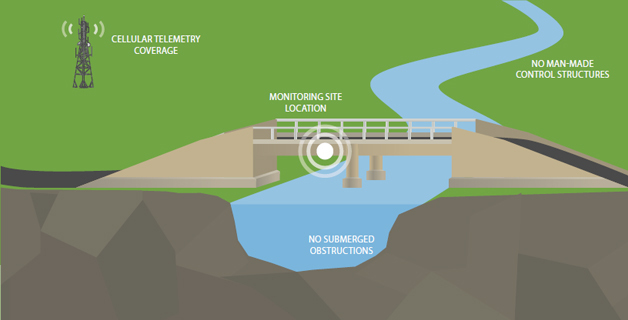 This can be done through routine monitoring, in which operating personnel make visits to stream gage and precipitation measuring sites, but a real-time monitoring system with telemetry can make data collection easier — and in many cases, more cost-effective — while allowing for the fastest possible response to a flood event. The NWS acknowledges that, even in areas where they provide flood warning coverage, a real-time, community-oriented flood warning system can reduce risks involved with flooding. The NWS forecasts floods using complex mathematical models that predict how rivers and streams across the U.S. will respond to varying levels of rainfall and snowmelt. These models are based on records of stream stage and discharge, the calculations for which are outlined below. If you are interested in developing a responsive flood warning system without advanced forecasting capabilities, however, you can likely get by with a system based on Automated Local Evaluation in Real Time, or ALERT gages. Developing a flood warning system requires attention to three basic factors: Data collection via gaging, data processing, and the hardware and software required, and the dissemination of flood warning information. While automated flood warning systems are often surprisingly inexpensive to implement, the primary factor determining cost for any such system is the number of gage site locations. Additionally, the type of communications and telemetry capabilities at each site will contribute to costs. There are a wide variety of automated stream gages that can transmit stream level data via telemetry, but gages developed according to the NWS ALERT protocol are among the most common and will be the focus of this guide. 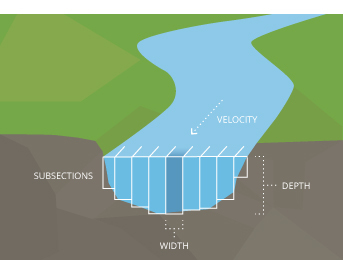 However, it’s worth noting that many other gages designed to measure precipitation and water level operate under similar principles, and this guide may be applicable to certain aspects of other systems. ALERT systems have the advantage of operating under a common standard of communications criteria, so although a wide array of manufacturers develop and produce ALERT hardware and software, most of those products are cross-compatible. ALERT gages perform two primary tasks: sensing and communicating. An ALERT gage employs sensors to detect changes to a certain parameter, usually precipitation volume and/or water level. More advances gages may also be equipped with temperature and wind speed sensors. Some ALERT gages can also provide site-specific information, or information regarding the health of the unit. In the example of a precipitation-measuring ALERT system, the gage will be designed to detect a particular “event” — in a common case, 1 millimeter of rainwater entering the gage’s tipping bucket through the top of its funnel. When the bucket tips, it pours out any water within, engaging a switch that transmits ALERT data and resetting the bucket. Any other sensors on the gage will also activate the ALERT data transmitter after detecting a specific event. On days without rain, ALERT gages will transmit a “no rain” report to show that the device is still working. The software used to collect and process data from ALERT gages will vary based on the user’s needs and preferences. Many ALERT gage manufacturers offer their own proprietary software to view data remotely, whether in a graphical or text format. The most useful ALERT processing software will permit multiple users to access the data simultaneously, and for multiple gages to be monitored at once. Automated flood warning systems may utilize radio, cellular, or satellite telemetry to communicate with a host computer or network, but ALERT systems specifically operate using radio frequencies. Because of this, ALERT systems can suffer from some of the same issues as any other radio transmission device, including interference from electrical noise and atmospheric conditions. Interference may also occur if several ALERT systems operating in a close vicinity transmit simultaneously. Satellite and cellular telemetry tends to avoid these problems, but still require some consideration to site selection in order to maximize transmission quality. Automated flood warning systems of all sorts will also require a power supply. While gages installed near developed communities may be powered by connection with a commercial power grid, those located in remote areas generally rely on a combination of battery and solar power to run their telemetry devices. As discussed above, there are a number of ways to configure an automated flood warning system, but the needs of one system can differ widely from another. The number of gage sites, their locations, and the instruments and sensors used at each will vary based on the nature of your application and the size of the intended coverage area. If your warning system is intended to service an entire community, the number of gages necessary will depend on the location of nearby water bodies in relation to property and infrastructure. If only a small portion of your community is exposed to a jutting stretch of river, for instance, one gage may be sufficient. In a single-gage system, installing a station on a riverbank or standing structure, such as a pier or bridge support, will likely provide the best results. Gages can also be built into stilling wells or standpipes, making it easier to include other instruments, such as multi-parameter sondes equipped with an array of sensors, as well as data loggers and telemetry systems. While radio transmission is the standard telemetry option for ALERT-based systems, satellite and cellular options may be more beneficial to your application, depending on its size and location. Nearly all telemetry options will provide continuous real-time data to any computer or mobile device, ensuring that your system runs smoothly, and any control measures or emergency actions can be implemented immediately if parameter limits are exceeded. Consisting of a funnel and a small container affixed to a tipping lever, rain gauges collect a set amount of precipitation before the container tips, dumping out any collected water and sending an electrical signal to a data transmitter. Data loggers can be mounted directly to the pier/abutment or to a pole on the bridge, depending on the location and recommended monitoring plan. Water level sensors using radar technology provide a non-contact alternative to other level gauging methods such as submersible pressure transducers, allowing for monitoring in hard to reach locations. Telemetry provides access to data in real time. ALERT transmits wireless communications via radio frequencies, but cellular and satellite-based options are also available. Instant access to project data is available 24/7 through a cloud-based data center. Monitoring data can be viewed in real time or as a graph to identify trends. Real-time automated alerts can be sent via text or email when specified parameters exceed predefined limits. As mentioned before, the ideal placement for a flood warning gage will depend largely on the site considerations of the waterway where it is located. Careful planning is needed to select the location, determine substrate stability and water level fluctuation, and to design a housing solution that will effectively protect the gage from acts of nature or vandalism. Physical constraints of a site, the time required to reach the location, legal and physical access to a site, and safety issues must be considered when making site selections. 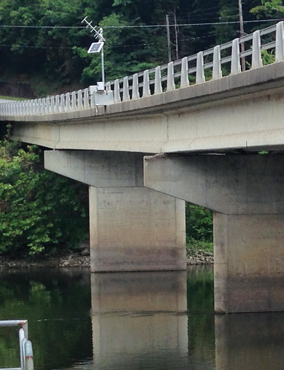 The monitoring location should have access to a bridge or overhead structure for securely mounting the radar sensor. There should be a clear path between the sensor and the water to avoid false reflections. If using telemetry, determine whether there is sufficient cellular coverage to get a signal at the site. If not, satellite telemetry will likely be required. Avoid submerged obstructions such as rocks or bridge piers that disturb or influence the water level. Check for such obstructions when the water is at the lowest anticipated level. The mounting location should also avoid horizontal structural surfaces such as beams, brackets, and side wall joints, these surfaces tend to reflect a strong false signal. Avoid man-made control/flow structures upstream or downstream of the site that may change flow profiles erratically, as this will making rating development difficult. The radar sensor should be mounted directly above the water surface, such that the radar beam is perpendicular to the water. The radar sensors should be securely mounted to prevent vertical displacement by wind or vibration. Any movement can disturb measurements and result in vertical alignment errors. 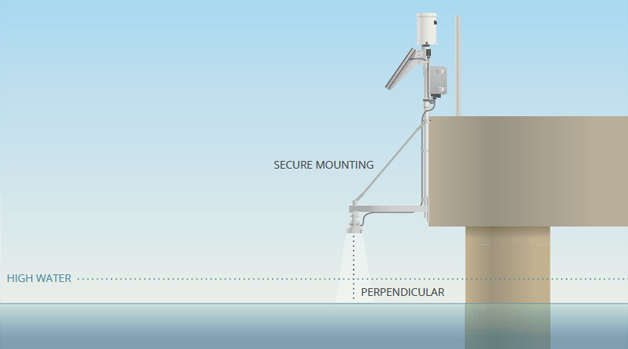 Make certain the radar sensor is mounted high enough to avoid being submerged during high water or flood conditions. Any potentially exposed sensor cables near the ground should be run through a conduit to the data logger box to protect from animals. Radar sensors are nearly maintenance free. There are is no calibration frequency or consumable parts to be concerned with. That said, it is still important to periodically visit the site to check for potential problems. Check the sensor for dirt, spider webs, insect nests, etc. that can lead to impairment of the measurement. 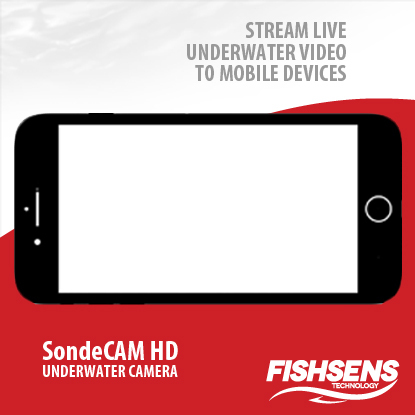 If obstructions are observed, carefully clean the sensor using a non-abrasive cleaner and soft sponge. It is also important to check for obstructions in the measurement beam. This can include flotsam or branches of trees and bushes growing in the water. Remove any beam obstructions. In addition to visually checking the sensor and measurement beam, it’s also important to periodically verify that the sensor is providing accurate data. This can be accomplished using a portable distance sensor or nearby staff gauge. When it comes to developing an automated flood management warning system, there are many pre-made ALERT systems available for purchase, but customizing a system to your specific needs may provide the best results. Fondriest Environmental has selected these products as the best in their field for their quality, reliability and value. Together, they provide an advanced and powerful real-time monitoring system for any river or stream prone to flooding. The RLS Radar Water Level Sensor from OTT uses radar pulse technology to measure depth in areas unsuitable for contact-based depth sensors. The HSA TB3 Tipping Bucket Rain Gauge offers reliable precipitation data with less than 3 percent margin of error for rainfall intensities from 0 to 500 millimeters per hour. The NexSens 3100-MAST Wireless Telemetry System features a mast-mounted data logging system with cellular modem telemetry and solar charging to keep your data up to date, eliminating the need to routinely visit a gage site. Additionally, the WQData LIVE web datacenter allows 24/7 remote access to collected data from any computer or mobile device, while incorporating instant alarm notifications and trend tracking. Fondriest Environmental, Inc. “Flood Warning Systems.” Fundamentals of Environmental Measurements. 17 Sep. 2015. Web. 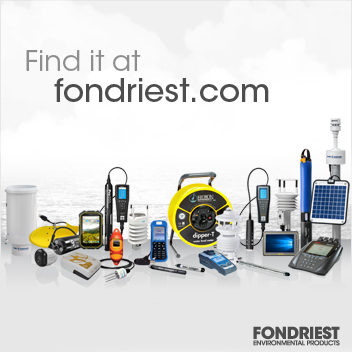 < https://www.fondriest.com/environmental-measurements/parameters/water-quality/water-temperature/ >.